This page describes the Applied Physics and Superconducting Technology Division contribution to PIP II. The main PIP II page can be found here. Proton Improvement Plan-II (PIP-II) is Fermilab’s plan for providing powerful, high-intensity proton beams to the laboratory’s experiments. Applied Physics and Superconducting Technology Division will be developing technology for the heart of PIP-II, a 800-MeV superconducting linear accelerator, capitalizing on TD expertise in superconducting radio-frequency (SRF) cavities and superconducting magnets. 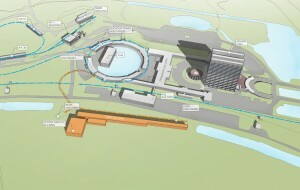 Once completed, the superconducting linac will be the starting point for the megawatt proton beam that is needed for the Long-Baseline Neutrino Facility. The superconducting linac for PIP II is uniquely challenging due to the operating requirements. In early implementation, the linac will be operated in pulsed mode, but it must be capable of operating in continuous mode as well. 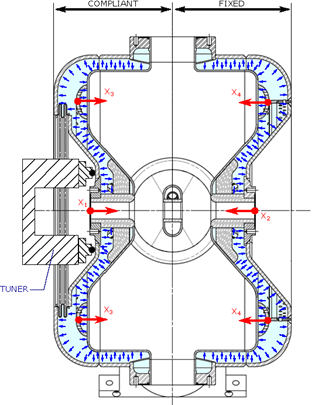 Under pulsed operation, the cavity mechanical design must be optimized to reduce Lorentz force detuning, a shift in the cavity frequency caused by a change in electromagnetic field intensity. Under continuous wave operation, the cavity mechanical design must be optimized to reduce the effects of microphonics, perturbations in the cavity frequency caused by helium pressure fluctuations and external vibrations. 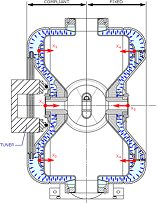 A substantial effort in engineering design, prototyping, and qualification was implemented in the Applied Physics and Superconducting Technology Division to make spoke-type and elliptical-type SRF cavities effective in both modes of operation. Fermilab is developing cryomodules to house all of the various superconducting cavities needed for the PIP-II linac. A completed cryomodule contains all of the SRF cavities, thermal and magnetic shields, cryogenic piping, insulation, and the cavity support system. The design of these cryomodules takes advantage of features used in similar cryomodules developed at DESY in Germany, Jefferson Lab, SNS and other laboratories around the world doing similar work. PIP-II cryomodules are closed at both ends with the only connection between adjacent units being the beam tube. 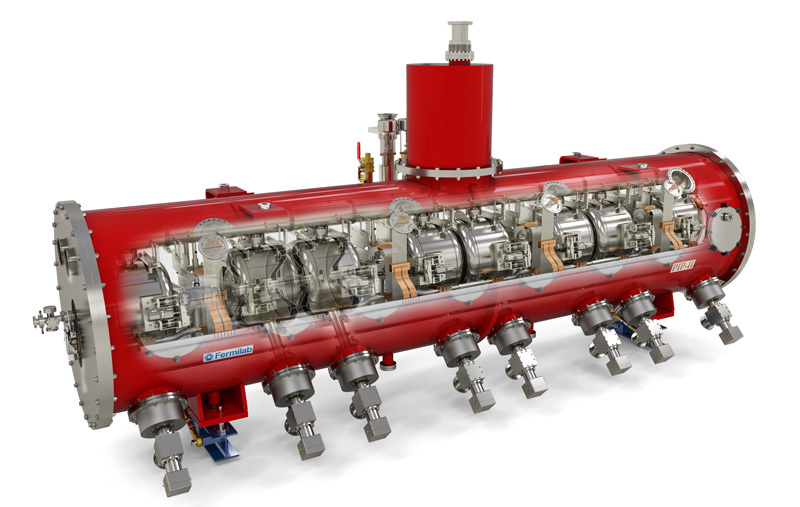 This requires individual connections to a common transfer line and individual 2 K heat exchangers in each cryomodule. Consequently, there is no large 2 K gas return as used in XFEL and LCLS-II cryomodules for cavity support. Rather, each PIP-II cryomodule employs a room temperature strongback inside the vacuum vessel, outside the thermal shield to which all of the cavities and magnets are attached via support posts similar to those developed for other cryomodule and magnet systems. The advantage of this design is that the support structure remains at a constant temperature and is not subject to distortion and deformations during cooldown. The Applied Physics and Superconducting Technology Division will have the first components for this new design concept in-house and will be completing the fabrication throughout the remaining months of 2016. TD is also involved with the design, fabrication and testing of magnets for the PIP II project. This includes variety of magnets – dipoles, quadrupoles and solenoids; conventional and superconducting devices. The devices are developed in collaboration with both domestic and international organizations/institutions. They are either part of bigger modules (cryomodules, multiplets), or mounted separately. In any case they are installed and tested on a beam line at FNAL according to the PIP-II project plans.